On Thursday evening, just before nightfall, a revolution was afoot at MIT. The battleground was set, the munitions were stocked, the targets were marked, and the soldiers were … robots. 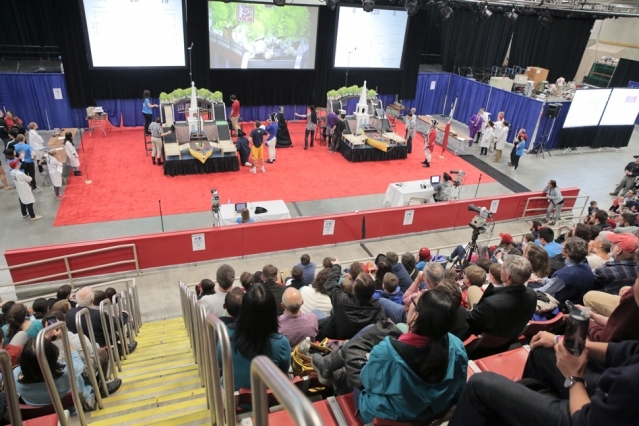 As hundreds of spectators crowded into Johnson Athletic Center, 32 student-built robots, winnowed down from a field of 153, squared off in the annual competition for Course 2.007 (Design and Manufacturing), MIT’s popular undergraduate course in mechanical engineering. 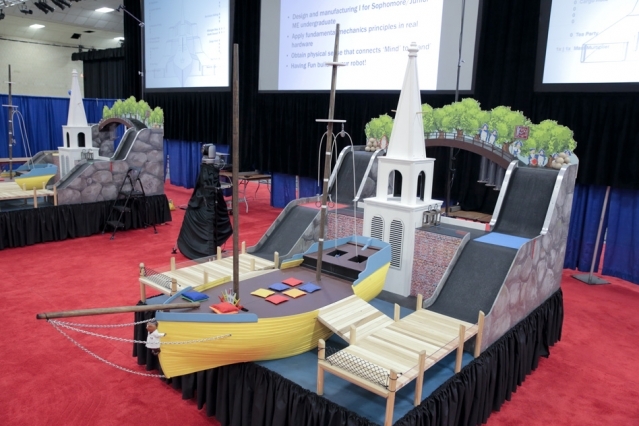 This year, instructors modeled the competition’s obstacle course after major landmarks from the American Revolution, including replicas of Boston’s North Church, Concord’s Old North Bridge, and a Boston Tea Party ship dubbed the H.M.S. Beaver. In head-to-head battles, robots sought to outscore their opponent by completing various tasks on the course, such as hanging small lanterns on the North Church steeple, pushing bags of tea off the wooden ship, scaling a steep hill to simulate Paul Revere’s ride, and hiding cannonballs under the Old North Bridge. To accomplish these tasks, students designed their robots to deploy some ingenious and often complex mechanisms. A remote-controlled robot, for example, was designed to telescope several feet up in the air to place a flag on the church steeple. Other students relied on a strategy of aggression; one robot was programmed to autonomously drive over the bridge and block its opponent’s access — a confrontational strategy that worked, at least through the semifinals, as the robot received both cheers and jeers from the MIT crowd. In the end, a simple, persistent, and powerful design won the day. Sophomore Austin Brown took home bragging rights, along with a laser-cut trophy of the MIT dome, for his autonomous robot, designed to launch from a custom-designed platform onto a rail bordering the Paul Revere hill. Two small motors powered the robot, racking up points each time it successfully scaled the hill. 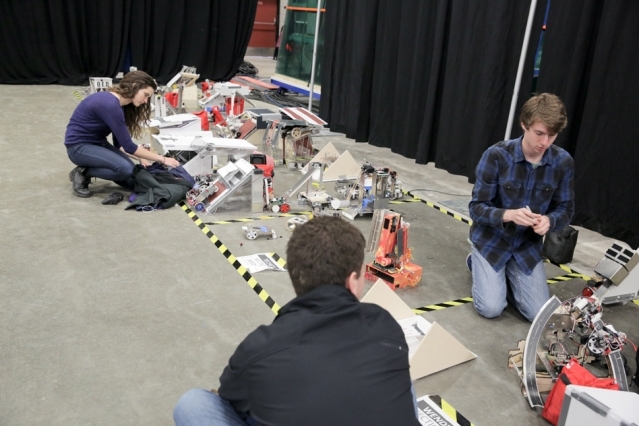 In the competition’s final round, the bot climbed the 60-degree slope every 1.5 seconds — a blistering rate that ultimately won the contest. “There’s no way we can have innovation without fabrication,” Kim declared, as he chased and ultimately enlisted Winter to his side. Indeed, 2.007 students spent all semester learning, then applying fabrication techniques to build their robots. At the beginning of the course, each student was given a kit containing materials such as pieces of plastic, metal, and wood, along with wheels, a small Arduino circuit board, and different types of motors with various levels of torque. Sophomore Andrea Gonzalez took a different tack, first tipping her robot against the hill, then launching it up with an Inspector Gadget-like scissor mechanism. Sophomore Ty Ingram muscled his way to the semifinals with a two-robot team, which he aptly named “Wrathful Roombas.” As he remotely drove one robot up and down a custom-built ramp, a second robot, decorated with a pirate flag, drove autonomously across the Old North Bridge and blocked its opponent from accessing a stack of cannonballs. Despite a clever design, Ingram’s pirate bot was ultimately outmatched by Brown’s persistent and powerful climber, in a dramatic contest that drew whoops from the crowd. In the final round, sophomore Jasmine Lennert challenged Brown’s robot with a design that first autonomously deployed her robot up a custom ramp, after which Lennert carefully drove the robot to pick up cannonballs and drop them down small holes in the Old North Bridge. “Something we stress is, ‘Practice, practice, practice your driving,’” Kim told the crowd. While Lennert’s driving skill helped her drop all of the balls in the holes, earning her 357 points, it was not enough to topple Brown, whose speedy hill-scaling robot earned him 1,178 points — and a victory march on the shoulders of Winter and Kim.